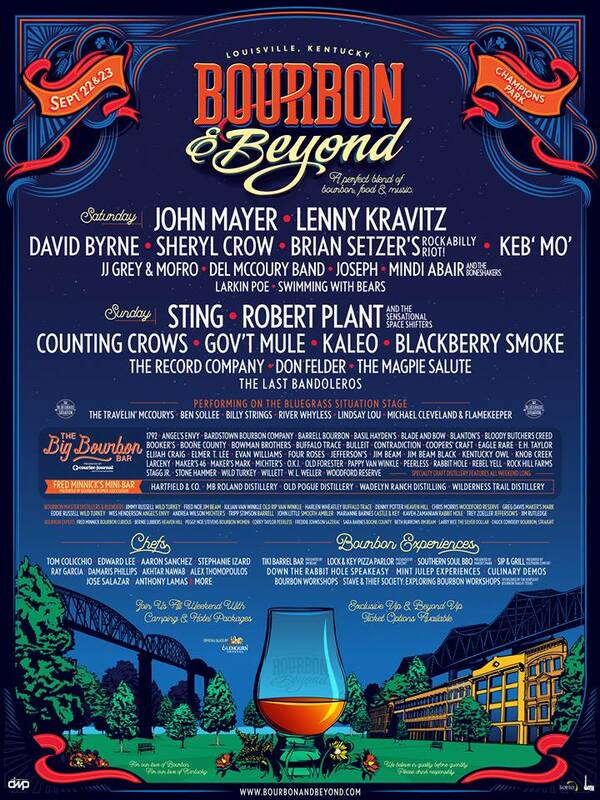 Following its highly successful initial festival in 2017, the second annual Bourbon & Beyond is scheduled for Saturday, September 22, 2018 and Sunday, September 23, 2018 at Louisville, Kentucky's Champions Park. The larger-than-life lineup features supporting acts that are as prominent as the headliners. Saturday's main acts include John Mayer, Lenny Kravitz, David Byrne, Sheryl Crow, Brian Setzer's Rockabilly Riot! and Keb' Mo'. The Sunday headliners feature Sting, Robert Plant and the Sensational Space Shifters, Counting Crows, Gov't Mule, Kaleo and Blackberry Smoke. But even the supporting acts are stellar - here are just a few: JJ Grey & Mofro, Larkin Poe, The Magpie Salute and The Record Company. As its name suggests, the costar of this weekend shindig is its famous Kentucky bourbon. 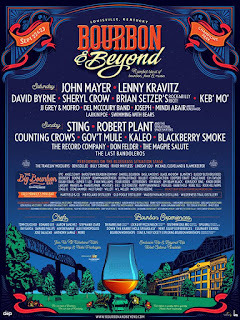 "The inaugural Bourbon & Beyond was a first-of-its-kind festival that gave Kentucky's world-renowned bourbons equal billing with a roster of legendary musicians," states Danny Hayes, CEO of Danny Wimmer Presents, the organizer of this incredible event. The tradition will continue this year with bourbon workshops, The Big Bourbon Bar, Fred Minnick's Mini-Bar, specialty craft distillery features and Whiskey Row Cigar Lounge. Culinary presentations also will be offered from multiple master chefs including Tom Colicchio, Stephanie Izard, Edward Lee and Aaron Sanchez, to name but a few. Camping is readily available with a wide variety of options, and local excursions are outlined at the website. For more information about this outstanding event including how to purchase tickets, click on the link below. What was a Performance!! Just wow!!! Every entertainment lover wants to see that kind of rocking performance in the live shows. Latest music festivals and concerts detail you can see for buying tickets.